A bunch of web enthusiasts on a pleasant Saturday morning of October’s first week had their weekend plans straight. 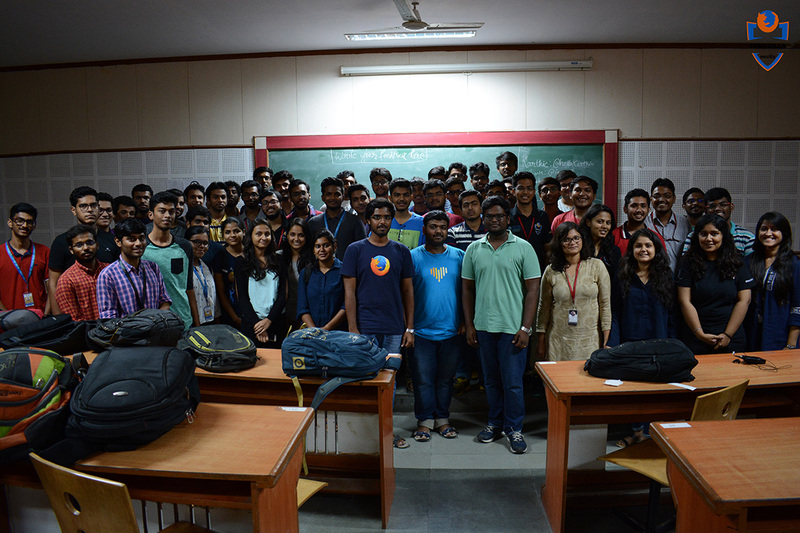 Around 45 of them gathered in a groundbreaking session and a workshop on Mozilla web extensions. Perhaps, all of us would be using those invaluable tools but only few wanted to dig a bit deeper and know how to create them. TechTonic was a two day hands-on web extensions and a hackathon conducted on 7th & 8th October 2017 at SRM University Kattakulathur, Chennai. The knowledge during the workshop was driven by Mr. KS Viswaprasath , Mr. Karthickeyan Narasimhan,Mr. Dinesh M V & Mr. Balaji prominent Mozilla Tech Speakers and Mozilla Campus Club advisory committee members. It was a part of the Activate Mozilla campaign. The objective of the event had been to teach the participants the process of making a web extension on the Firefox browser. Initially, the flow of it starts with conceptualizing the idea, then weighing its pros, coding it, testing and uploading it for verification. 4:10pm new tab add-on explained. Repeat CSS background template explained. Participants asked to check out tweet beam. 4:20 pm: Momentum add-on explained and requested to make a similar add-on on our own. 4:25pm: Override the main page of a browser using a unique set of own build add-on. 430pm: Extending add Facebook and linked in add on in Google Chrome home page. 4:40pm: Hacktoberfest introduced. Participants will submit the template designed by them on the first day using GitHub Repository. 4:45pm: Introduction to GitHub repository. Participants asked to start a new project and create a new repository and upload their extinction files there. 5:05pm: The much awaited “Red Bull” break. 5:55pm: The evening concluded with a summing up the recap of the day. 4:30PM: An interactive session took place where all the four Mozilla reps shared their experience about the workshop. Also they told the participants about the Open Source World and opportunities for contribution towards it. A small description of The Lightning Fast upcoming browser-Firefox Quantum 57 was also given by the Reps. 6:00PM: The 2-Day workshop came to an end with clicking a group photograph and with a hope of conducting more of such sessions in the future. The whole event had been successfully executed with minimal financial expenses, thanks to the unparalleled support from the management of SRM University. And the voluntary and progressive fervor of the presided tech speakers. The participant were thoroughly satisfied with what they have learnt in the workshop and also mentioned they would gladly attend any similar endeavors of the club initiated by Activate Mozilla Campaign. Goodies like some sponsorship coupons and Mozilla stickers etc were distributed to the participants. Team SRMKZILLA would like to thank Redbull for their generous sponsorship of energy drink to participants during the events. 4.Mudassir Mohammed - Dictionary - https://github.com/sakhtcoder/Dictionary - This extension gives you the meaning in a click, instead of searching for it all over. 5. Ankit kishore - Keyword History Cleaner - https://addons.mozilla.org/en-US/firefox/addon/keyword-history-cleaner/ -GIT-HUB : https://github.com/ankit9971/Keyword-History-Cleaner - History API - Deletes the history with help of the keyword. Delete the al the history which has the keyword in it URL or in the title. Download and Delete History...instantly using Keyword, with just 1-click on the Eraser button! 8.Raunak Adak - MeanSomething -https://github.com/raunak249/My-Extensions/tree/master/Meaning - tabs API - It provides a place to directly search for a meaning instead of instead of going to google and searching it.